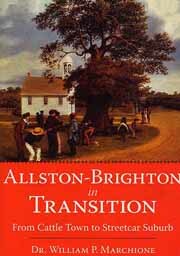 $25* Allston-Brighton has a fascinating and unique past, a history so varied, so filled with twists and turns as to constitute a microcosm of our national experience. From its founding in the seventeenth century, when it was known as Little Cambridge, to its contemporary incarnation as a vibrant Boston neighborhood, Allston-Brighton has remained a spirited community through generations of change. John Eliot established his first Praying Indian village, Nonantum, here in the late 1600s; the Winships Brighton Cattle Market prospered from 1776 through the nineteenth century, meriting several visits from both vagrants and notables, including Nathaniel Hawthorne; and the Beacon Trotting Park provided entertainment in the late 1800s. Along the Charles, through Aberdeen, at the market and on the first electric streetcars, Dr. William P. Marchione provides a journey through the stories of Allston-Brighton's past. 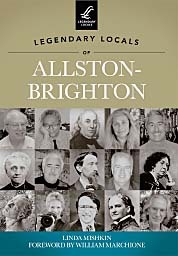 $26.99* Legendary Locals of Allston Brighton presents images and brief narratives of remarkable people. It includes those from distant history, recent history and current day. Here are some of the people who create the culturally and historically rich community of Allston-Brighton. What is notable is the diversity of talents, backgrounds and interests of those represented in this volume; and what is equally worth mentioning is that only time and space precluded numerous others from being included here. Linda Mishkin is a long-time resident of Allston-Brighton. Her interviews with business owners and organization leaders appeared in the Allston-Brighton Tab. She co-edited, with William Marchione, the Women of Vision guide to the Women’s Heritage Trail. She is Vice-President of Special Projects with the Brighton-Allston Historical Society. $23* Authored by BAHS President Linda Mishkin, this book is a compilation of over 50 stories and recipes from local residents. 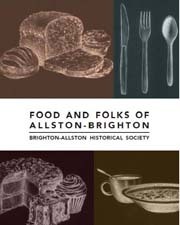 Dozens of neighbors from a range of backgrounds volunteered to be part of the book, offering a personal or family recipe along with a story to put the recipe in context. Our community cuisine includes flavors created locally and brought here from places around the world. It’s a mix of family favorites and long standing cultural traditions.